Hurricane Harvey leaves Houston and the coastal Texas cities under water. 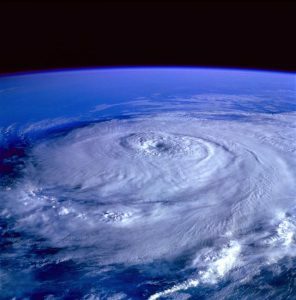 As the cities braced themselves for the brunt of a category 4 hurricane, no one would have predicted that inland Texas counties would have experienced the worst of Hurricane Harvey. The death toll and devastating destruction is staggering. The areas around Houston are covered in flood waters—a disaster few were prepared for. Please were in shock and so much was ruined. The trouble was a result of the mix of wind damage and a low saturation water tables. Of course, this news hits us hard here at ScanMyPhotos. Unfortunately, the very nature of natural disasters is highly unpredictable—damage can happen at any place and at any time. Whether from wildfires, earthquakes or severe storms, there are no ways to predict the lasting damaging that reels families for years beyond. Or, what about the tornadoes which touched down and tear apart roofs on homes? These freak incidents can and do happen. Are Your Family Photos Prepared For Any Disaster? Summer might be winding down, but there is still time to get a few more fun activities in with the kids! 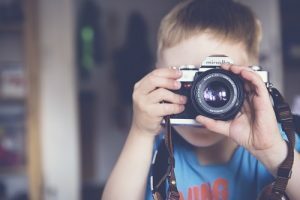 We’ve pulled together a list of photography project ideas that will help teach your little ones how to learn composition, exposure, camera settings, and more. Not only are these projects are great opportunity to teach and learn, but they can be a lot of fun and will result in lasting memories. [Reposted] We received an email from a past client with a story that was both heartbreaking and an uplifting preparedness tip. 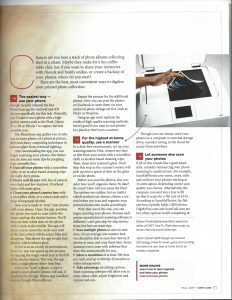 It got us thinking, again, about how a company that scans photos is so important in people’s lives and why it is vital that no one should delay in getting their photos scanned. Insurance replaces your material items but do you know what you can’t replace but you can protect? Your photos. You can buy a new TV, sofa or refrigerator but can you buy your daughter’s first steps or your wedding day? 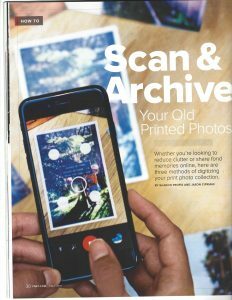 Whether you use ScanMyPhotos, some other photo scanning company or you are inspired to go out, buy a scanner and do it yourself, we URGE you to scan your photos now! You never know what tomorrow may bring. For some reason, I felt a urgency to convert many of our photos to disks. I worried about preserving them. Twice I sent a box of photos to you and felt great relief loading them onto my computer. 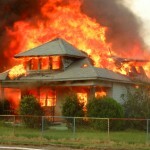 The morning of November 12, 2012 I awoke to the unimaginable- our house was on fire! We managed to make it outside with just the clothes on our back. As the flames rolled through the roof I knew we were losing everything. Thoughts of family heirlooms disappearing and our family photos burning and the loss of those felt vnbearable. I realized that just inside the front door was my laptop and on it were hundreds of our favorite treasured pictures! I opened the door, reached in for the laptop and yanked it out of the wall it was charging in. That was the only item I saved that day. Now, as we slowly rebuild our house and our lives I know a precious part of our past remains because of the service you provide! I never would have thought our new house would catch fire. Now we look forward to the future, but thanks to your company we still have our connection to the past. You’ve made a difference in our lives. Please DO NOT WAIT. Scan your photos, negatives, and slides today. Don’t forget those old home movies, too. 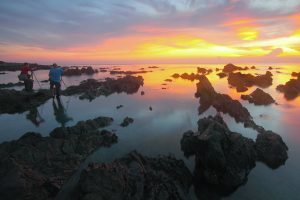 As Pat said, by scanning their family photos, “we still have our connection to the past” and that is what photos represent, a connection to family history for present and future generations. 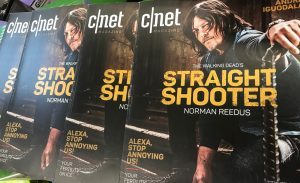 The Fall edition of CNET Magazine features (page 30) a profile on how to reduce clutter and share nostalgic memories by digitizing your entire collection of decades-past photos. Among the methods profiled is to have a professional bulk photo scanning service do all the laborious work for you. 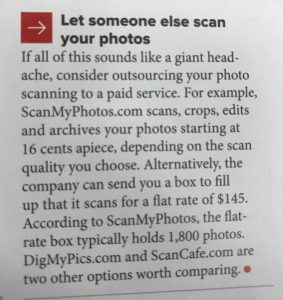 If all of this sounds like a giant head-ache, consider outsourcing your photo scanning to a paid service. For Example, ScanMyPhotos.com scans … your photos starting at 16 cents apiece, depending on the scan quality you choose. Alternatively, the company can send you a box to fill up that it scans for a flat rate [including free 3-way S/H] for $145. According to ScanMyPhotos, the flat-rate box typically holds 1,800 photos. Shooting on location can be an exciting opportunity for any photographer—whether you’re an amateur or seasoned pro. And what better place to have a fun summer photo shoot than the beach? You can take your pick (pun intended) of action shots of friends riding the waves or get the whole family together to pose around the latest sand castle creation.